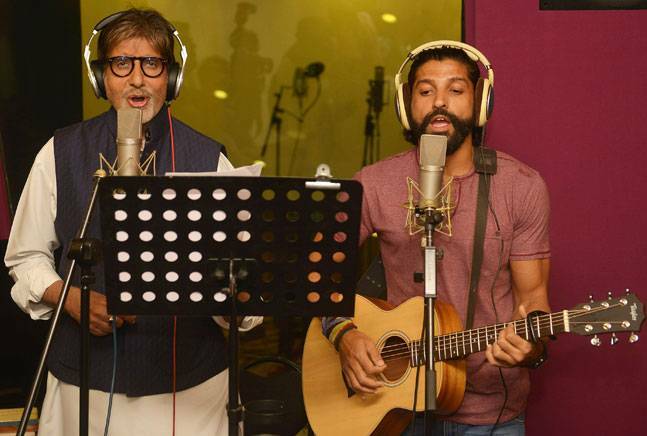 The legendary actor, Amitabh Bachchan, along with his multi-talented co-star, Farhan Akhtar, went behind the microphone to record a duet called Atrangi Yaari, for their forthcoming film, Wazir. Wazir has been produced by the cult filmmaker, Vidhu Vinod Chopra, under his production house, Vinod Chopra Films. A special music video of the song has also been shot and will be featured during the end credits of the film. Atrangi Yaari has been composed by the music director, Rochak Kohli, while the lyrics were penned by Gurpreet Saini and Deepak Ramola. Wazir, which will have a global release on 8th January 2016, is about two unlikely friends- a wheelchair-bound chess grandmaster (Amitabh Bachchan) and an ATS officer (Farhan Akhtar). The two characters are brought together by grief and a strange twist of fate as part of a wider conspiracy that has cast a dark shadow over their lives.